Legacy Simplecast - Can I Have Multiple Podcasts on One Simplecast Account? Q: Can I have multiple podcasts on one Simplecast account? A: Yes! It's very easy to manage multiple shows from your Simplecast account. Each additional show will be $12/month, or $120/year. So two shows would be $24/month, three shows would be $36/month, and so on. Note: There are no limits on episodes, so you can upload as many episodes as you'd like. 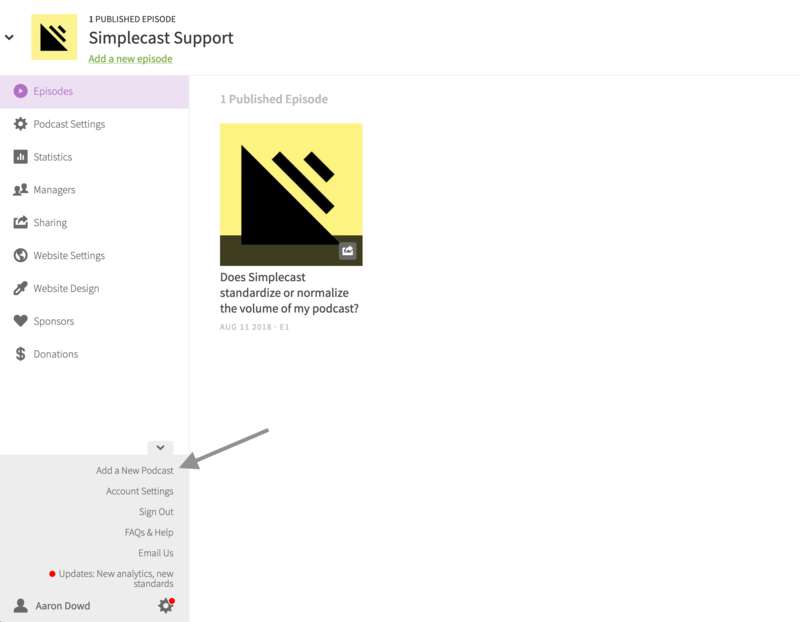 You can add a new show by clicking on the little gear icon in the bottom-left side of your Simplecast dashboard, then selecting Add a New Podcast, or by visiting http://simplecast.com/podcasts/new. Once you have multiple shows in your account, you can easily switch between them by clicking the little arrow next to your show's artwork in the top-left side of your screen. If you're going to run multiple shows, you might be interested in learning about how to invite a manager to help. Still have questions? We'd be happy to answer them. You can start a live chat with someone from our team by clicking on the chat icon down there on the right.